Posted by admin on Nov 8th, 2018 and filed under Frontpage. You can follow any responses to this entry through the RSS 2.0. Both comments and pings are currently closed. 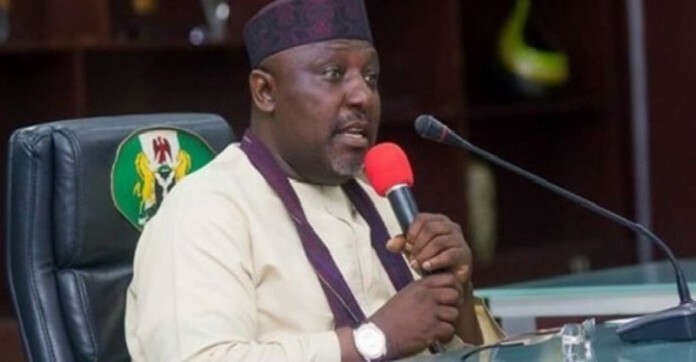 Apparently irked by Owelle Rochas Okorocha’s claims following the APC submission of name of Chief Hope Uzodinma as winner of the APC Governorship primaries for Imo State, the Orlu zone Senator has chided the Governor by stating that he is a paper tiger in the field of politics. “A statement in Owerri on Tuesday by Declan Emelumba; the Director of media and special duties to the APC governorship candidate in Imo state, Sen. Hope Uzodimma, said the only reason why APC is back on track in Imo and set to sweep all the elections in 2019 is because of the emergence of Sen. Uzodimma as the guber candidate of the party in the state. The statement said that Governor Okorocha’s membership of the party was a big minus and that contrary to the empty claim by him, if His son-in-law had won the APC guber ticket in Imo, it would have been the surest ticket to the total defeat of APC in the state. “Emelumba said Okorocha was deluding himself of an imaginary popularity in Imo state when in reality he is very unpopular with the populace; the Christian churches, Traders, Artisans, Civil servants and professionals in the state, noting that he has not actually won an election in the state, and that Sen. Uzodimma on the other hand has defeated (him) Okorocha in all the elections he contested in Imo West (Orlu) Senatorial District, where both of them came from. “Okorocha has run for many elections, including the governorship of Imo state, before 2011, and even the presidency, and lost all. But in 2011 in particular, Imo people voted more against former Governor Ikedi Ohakim than for Okorocha, so he merely benefitted from the anger of the people against Ohakim. Even at that, the election went into a bi-election where Ohakim was finally manipulated out of the race and Okorocha became Governor. Also in 2015, Okorocha as incumbent governor could not win outright on first ballot. The election was concluded on a second ballot where some aggrieved PDP members helped again to manipulate him into the governorship”. The statement said. “According to the APC Governorship spokesman, Okorocha cannot really say he won these elections on merit, adding that if he (Okorocha) was really popular as he imagines, he should have won outright on merit in these two elections. “The statement noted that Uzodimma defeated Okorocha’s political party in Imo west senatorial district in both 2011 and 2015, even as governorship candidate and incumbent Governor respectively. “’I think this is more than enough evidence that in terms of popularity, Sen. Uzodimma is far more popular than Gov. Okorocha in Imo west(the biggest senatorial district in Nigeria) where both come from. “Emelumba added: “the truth of the matter is that all strata of Imo society are celebrating Uzodimma’s victory as the APC guber candidate and this has brought them back on track to vote massively for APC in 2019. Uzodimma’s popularity in Imo state is positively infectious and it will not only guarantee victory for APC in Imo state but will rake in far more than 5 million votes for the APC from the South East in 2019. So let no one be deceived by Okorocha’s boast because he is the problem of APC in Imo State and the South East”.